Sizes can differ from one manufacturer to another. It can also be the case that different lasts from the same manufacturer fit differently. 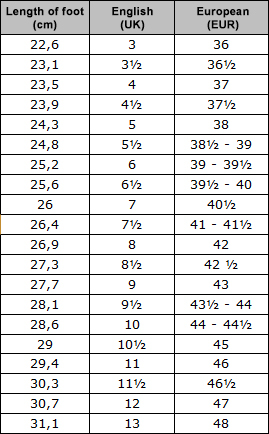 Below this text you find a size chart which is ment to help you find your size. If the ordered shoes do not fit, please let us know. We will send you a return label to provide a free return for you. As soon as the return will have arrived with us, we will be glad to send you another pair in a smaller or bigger size (in case it is available)! In this chart you can see how your foot length compares to the UK and European (French) sizes. Think! shoes differ in size and width, if they were made on different lasts. To help you to get along with all the different lasts and how they fit, we also offer our last guide. Please feel free to contact us any time, if you need further information.